The Star Trac E-RB recumbent bike is yet another great output from the Star Trac conglomerate. Regarding luxury, Star Trac did not miss a beat; they structured this recumbent bike with consists of, which make for a comfortable position without the added pressure on your shoulders; they incorporated an adjustable book/magazine station, for those who enjoy reading; and installed the hook-ups for an additional entertainment system, which includes a 15” personal viewing screen and entertainment controls. 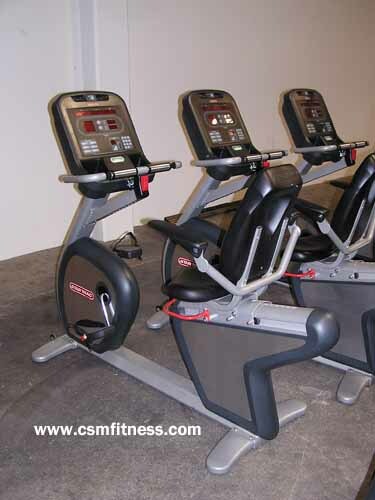 Additionally, this recumbent bike also includes the potential for several heart rate monitoring options (a chest strap or grip pulse, for example), a one-piece crank with sealed bearings (which results in a smoother and quieter workout), and a big luxurious display screen with all the amenities any fitness enthusiast would desire. Preprograms: 11 programs: (2) heart rate control, (2) watts control, fitness tests, etc.